Bonnie Mitsui is the owner of a 630-acre ranch adjacent to Lafferty Ranch, covering much of the top part of Sonoma Mountain. She has long been a supporter of Lafferty Park, and of responsible public access to, and enjoyment of, Sonoma Mountain. 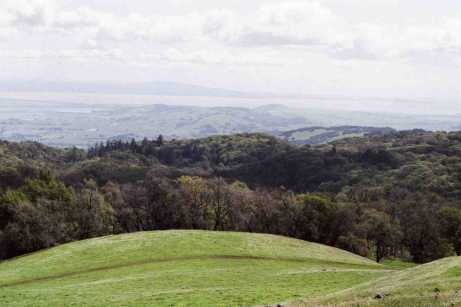 In a letter to California state officials earlier this year, Ms. Mitsui offered to donate a public trail easement across her ranch, well over a mile in length, once Lafferty Park is opened Park to the public, and connections are established to Jack London State Historic Park on the northeastern slope of the mountain. 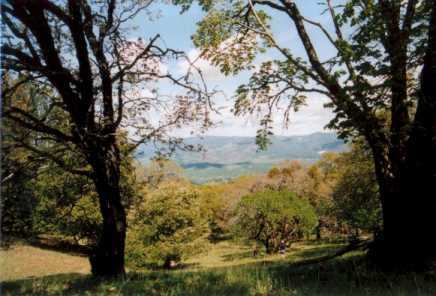 Press coverage of Bonnie Mitsui's "Over the Mountain Trail" offer and its significance for Lafferty Park and public access to Sonoma Mountain in general, beginning mid-June 2003. See also FLP's press release of June 16, 2003 and letters to the editor on this topic. A short background page with links to information about Ms. Mitsui. A parcel map of upper Sonoma Mountain, showing how the Mitsui ranch covers more than 95% of the distance between the Lafferty Park and Jack London State Park. What follows are a few photographs taken by Friends of Lafferty Park on tours of Ms. Mitsui's property. 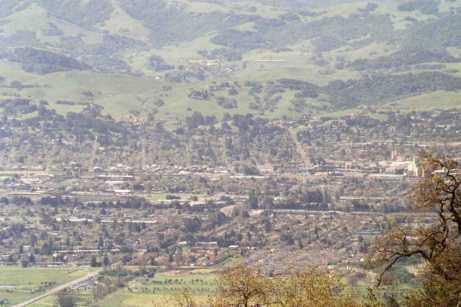 Inspired to help realize this vision for upper Sonoma Mountain? See FLP's Letter Guidelines and let your public officials know where you stand. 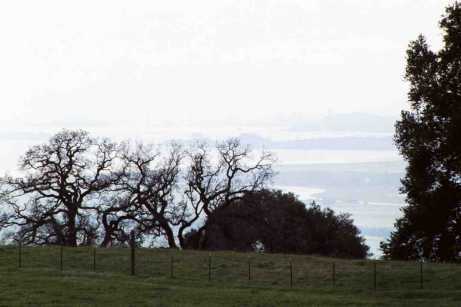 View of the Petaluma Valley from the Mitsui Ranch near where it adjoins the corner of Lafferty Park. Looking at upper Lafferty Park where its corner touches the corner of the Mitsui Ranch. Seven-foot high chanlink fence built by Lafferty (and Mitsui) neighbor Peter Pfendler on his property line with Lafferty Park. 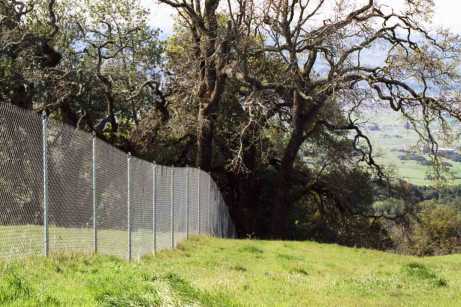 This fence, nearly a mile in length, completely impedes the movement of most wildlife. 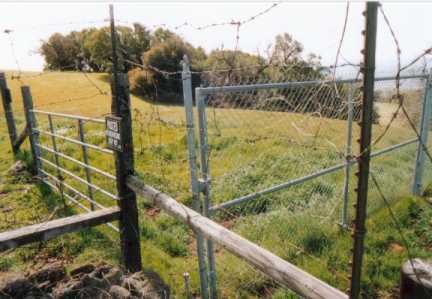 A trail corridor through this part of Sonoma Mountain would also serve as a wildlife corridor, allowing wildlife to circulate freely around this fence and other man-made barriers. 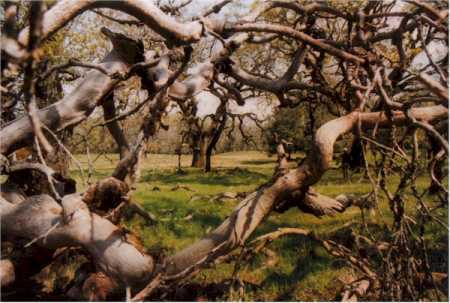 Tangled limbs of a fallen oak tree in winter. View to the south from the Mitsui Ranch. The skyline of San Francisco and the SF/Oakland Bay Bridge can just be distinguished. View toward the South by Southeast. Carriger Creek canyon, the south Sonoma Mountains, San Pablo Bay, and the East Bay hills around Carquinez Straights. The ranch road in the foreground might well be on or near the eventual trail alignment. 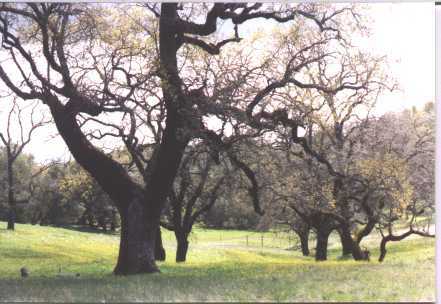 Oak savannah, the typical vegetation on the part of the Mitsui Ranch the trail would pass through, and a glimpse of the Sonoma Valley to the east. 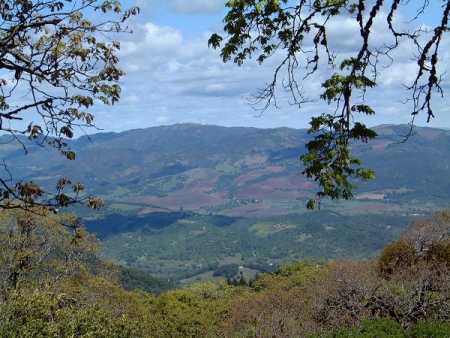 View of the northern Sonoma Valley and the Mayacamas beyond. Jack London State Park is only about 500 feet from where this picture was taken near the northeast corner of the Mitsui Ranch. 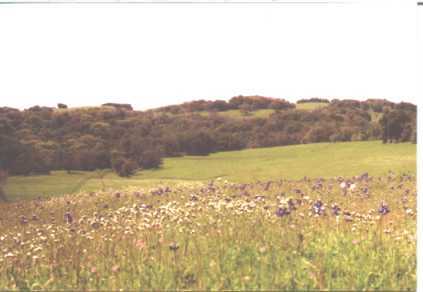 Looking southwest, back along the trail alignment amid Spring wildflowers, in the direction of Lafferty Park. Lafferty is 1.2 miles away, across the woods in the middle of the photo, which shelter some of the headwaters of Fowler/Carriger Creek. Buttercups and oaks west of the trail alignment, roughly 1/3 or the way between Lafferty and Jack London State Park. Photos by Yigal Toister, Dave Libchitz, Hank Zucker, Bruce Hagen, and Larry Modell.